The U.S. electric vehicle (EV) market will reach a major milestone this month as automakers reach 1,000,000 EV sales. 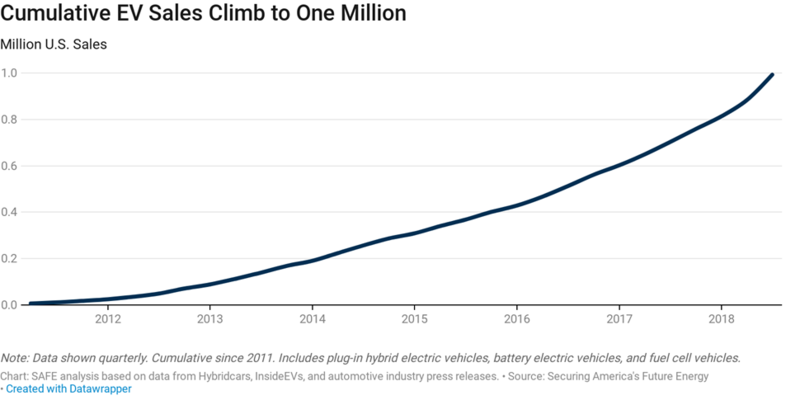 Cumulatively, over 992,000 EVs have been sold since January 2011, according to a SAFE analysis of data from Hybridcars, InsideEVs, and automotive industry press releases, with 110,000 EVs sold in Q3 2018 alone. The imminent sale of the one-millionth EV is a significant milestone that brings the U.S. one step closer to reducing our transportation systems outsized dependence on oil. This achievement is a direct result of the tireless efforts by communities and advocates throughout the EV ecosystem. Automotive manufacturers are starting to deliver EVs consumers want, and buyers are realizing the value and benefits of driving electric. While this momentum is a great moment in the push for the accelerated adoption of EVs, the U.S. needs to continue to push for policies and support ongoing efforts to make the future of transportation electric. 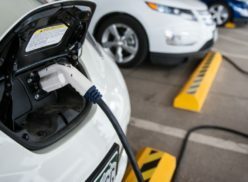 Targeted research and development, technological breakthroughs, and the ongoing expansion of a nationwide charging infrastructure culminated in the decades-long movement to one million EVs. Industry leaders, including BMW, Nissan, Chevy, Honda, and Toyota, expanded their product offerings and increased the range, affordability, and efficiency of their lineups. Since 2012, these investments have helped bring the average cost per mile of range down from more than $500 per mile to less than $300 per mile. That may not seem like a lot, but in terms of total cost and battery size, an additional $200 per mile of savings off MSRP indicates EVs are going further and for a lot less. Along with the Model 3, Tesla saw successes across its entire product line with the high-end Models S and X also ranking among Q3 2018’s top five best-selling plug-in vehicles in the U.S.
Tesla, Inc., is owed at least some credit for helping move the market. In addition to expanding its nationwide network of fast chargers along highly-trafficked corridors, the company cut costs by scaling up production at its Nevada Gigafactory starting in 2016. The mid-size Model 3 sedan offers 220 miles of all-electric range at a minimum $35,000 before incentives. Despite early skepticism that it could keep pace with its ambitious production schedule, Tesla met its Q3 2018 goals and sold over 54,000 cars. Along with the Model 3, Tesla saw successes across its entire product line with the high-end Models S and X also ranking among Q3 2018’s top five best-selling plug-in vehicles in the U.S.
Nissan, Chevy, and Toyota have also been innovators in the space by adopting different strategies to broaden their appeal and win over early-adopting enthusiasts. Nissan Motor Company became one of the first major automakers to mass-produce a pure EV, introducing the Leaf in 2011. Nissan has since rolled out a 2018 model year version that receives over 150 miles of range at $29,900 before incentives. Chevy, meanwhile, introduced the Volt PHEV in 2011, appealing to consumers who felt more comfortable with a hybrid-battery electric and gasoline engine powertrain. The Volt dominated the market early on, but in 2012 the plug-in Toyota Prius created strong competition among PHEVs. In 2018, automakers have introduced more than 46 advanced fuel vehicle models, including 28 PHEVs, 15 EVs, and three fuel cell vehicles. The sales picture was not always so rosy. 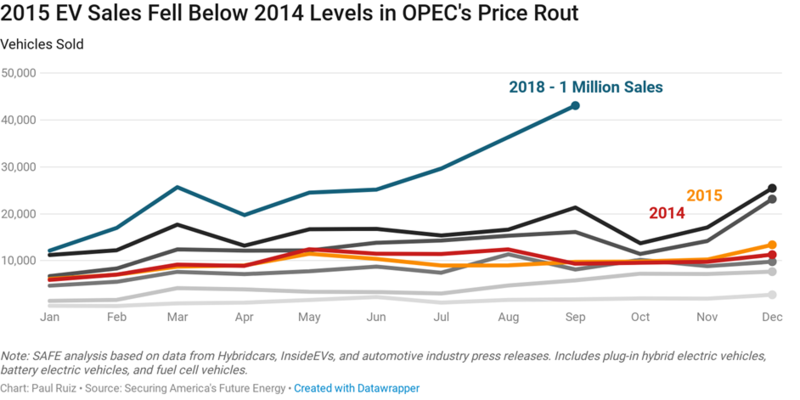 Oil prices collapsed in 2014-15, temporarily denting the market for new EVs. Saudi Arabia, alongside its coalition of OPEC producers, flooded the market with low-cost crude, causing gasoline prices in the United States to fall to multi-year lows. The average monthly price of the global benchmark Brent fell from a June 2014 high of $112 per barrel to a January 2016 low of $31 per barrel. In 2015, EV sales uncharacteristically tracked at or below 2014 levels with the weakest month being July when sales were 21 percent below the previous year. The effects of the 2014-15 oil price rout were quickly overcome the following year when OPEC agreed to cut production and increase prices. Memories of the troubles caused by high gasoline prices were short-lived, however, as sales of less fuel-efficient light trucks reached record highs. Bloomberg estimates that by 2020 there will be 120 electric car models available with every major auto manufacturer in the market. 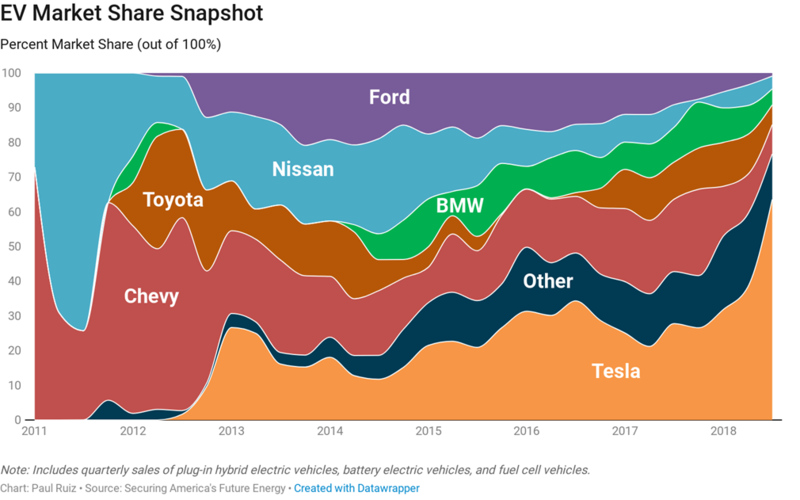 As the U.S. passes the one-million EV sales mark this month, consumers are again looking to electricity as a reliably-priced alternative to gasoline. 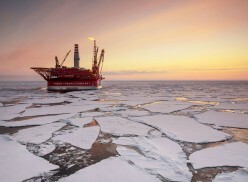 Oil prices passed a $86 per barrel high this month and may rise to over $100 per barrel this year as turmoil in several oil-producing nations further restricts output. For Russia and Saudi Arabia, the accelerating global EV industry is a major threat to oil demand. Although EVs account for less than 1 percent of the market, that proportion is growing quickly. Bloomberg estimates that by 2020 there will be 120 electric car models available with every major auto manufacturer in the market. As automakers near the 200,000-vehicle cap for the federal $7,500 tax credit, it is crucial that Congress continues to recognize the value of consumer choice in transportation fuels. Incentives for adoption, like the $7,500 tax credit, will maintain this accelerated effort toward the next one million EVs. 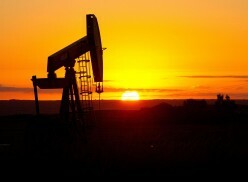 The Fuse is an energy news and analysis site supported by Securing America’s Future Energy. The views expressed here are those of individual contributors and do not necessarily represent the views of the organization. A series of accidents in North America in recent years have raised concerns regarding rail shipments of crude oil. Fatal accidents in Lynchburg, Virginia, Lac-Megantic, Quebec, Fayette County, West Virginia, and (most recently) Culbertson, Montana have prompted public outcry and regulatory scrutiny. 2014 saw an all-time record of 144 oil train incidents in the U.S.—up from just one in 2009—causing a total of more than $7 million in damage. The spate of crude-by-rail accidents has emerged from the confluence of three factors. First is the massive increase in oil movements by rail, which has increased more than three-fold since 2010. Second is the inadequate safety features of DOT-111 cars, particularly those constructed prior to 2011, which account for roughly 70 percent of tank cars on U.S. railroads. Third is the high volatility of oil produced from the Bakken and other shale formations, which makes this crude more prone towards combustion. Provides new sampling and testing requirements to improve classification of energy products placed into transport. The newly prescribed tank car, the DOT-117, has 9/16 inch tank shell, 11 gauge jacket, 1/2 inch full-height head shield, thermal protection, and improved pressure relief valves and bottom outlet valves. Additionally, thousands of older tank cars will require retrofitting by as early as 2018. Since the rule was announced, Republicans in Congress sought to roll back the provision calling for an advanced breaking system, following concerns from the rail industry that such an upgrade would be unnecessary and could cost billions of dollars. The advanced braking systems are required to be in place by 2021. Democrats in Congress have argued that the new rules are insufficient to mitigate the danger. Senator Maria Cantwell (D-WA) and Senator Tammy Baldwin (D-WI) both issued statements arguing that the rules were insufficient and the timelines for safety improvements were too long. The current industry standard car, the CPC-1232, came into usage in October 2011. These cars have half inch thick shells (marginally thicker than the DOT-111 7/16 inch shells) and advanced valves that are more resilient in the event of an accident. However, these newer cars were involved in the derailments and explosions in Virginia and West Virginia within the past year, raising questions about the validity of replacing only the DOT-111s manufactured before 2011. Before the rule was finalized, early reports indicated that the rule submitted to the White House by the Department of Transportation has proposed a two-stage phase-out of the current fleet of railcars, focusing first on the pre-2011 cars, then the current standard CPC-1232 cars. In the final rule, DOT mandated a more aggressive timeline for retrofitting the CPC-1232 cars, imposing a deadline of April 1, 2020 for non-jacketed cars. Do Automotive Dealers Want to Sell Electric Cars? We weren't able to sign you up for our newsletter. Please check your email address and try again. The recent oil production boom in the United States, while astounding, has created a misleading narrative that the United States is no longer dependent on oil imports. Reports of surging domestic production, calls for relaxation of the crude oil export ban, labels of “Saudi America,” and the recent collapse in oil prices have created a perception that the United States has more oil than it knows what to do with. This view is misguided. While some forecasts project that the United States could become a self-sufficient oil producer within the next decade, this remains a distant prospect. According to the April 2015 Short Term Energy Outlook, total U.S. crude oil production averaged an estimated 9.3 million barrels per day in March, while total oil demand in the country is over 19 million barrels per day. This graphic helps illustrate the regional variations in crude oil supply and demand. North America, Europe, and Asia all run significant production deficits, with the Middle East, Africa, Latin America, and Former Soviet Union are global engines of crude oil supply.